Going to Egypt way back in 2007 was my first big overseas adventure. I was only 20 years old and I didn’t know anyone, even though it was with a group of students from my university. Travelling to a country that is so different from my own taught me a lot of things, especially about appreciating the things I do have. Please excuse the quality of my photos – these were taken back in 2007! Here are 10 places I visited while in Egypt and what I really enjoyed about them. Alexandria is the second-largest city in Egypt and sits right on the Mediterranean Sea in the north. It was founded by and named after Alexander the Great (one of my favourite historical figures) in approximately 331 BC. View of the Mediterranean from our hotel. Alexandria was once the site of the Library of Alexandria, one of the largest libraries in the ancient world. Sadly it burnt down and much of the knowledge contained within was lost. 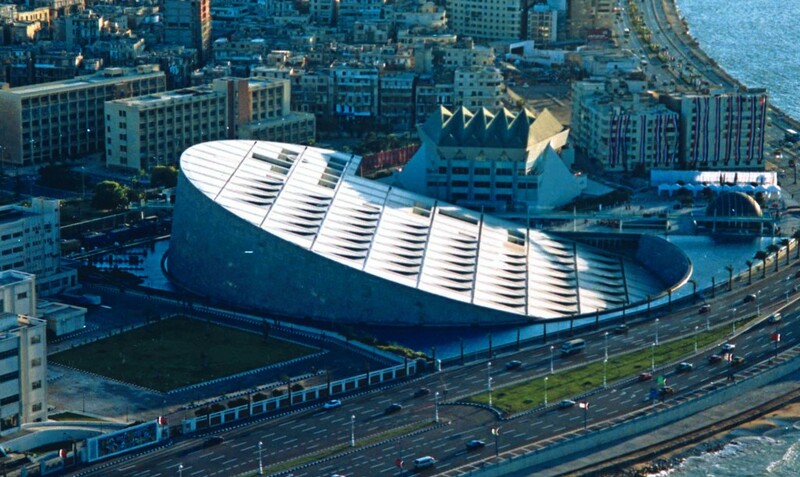 A modern library, the Bibliotheca Alexandrina, was established in 2002. If you are visitng Alexandria, I would highly recommend taking the time to see the library. It is just breathtaking. What’s a trip to Egypt without the Giza plateau? Here you will see the pyramids of Khufu (the Great Pyramid), Khafre (the middle pyramid that looks bigger) and Menkaure (the little one), as well as the Sphinx. The Great Pyramid took 14 years to build and required more than 45,000 workers to move the materials from the quarry to the site in just the first year. Because of the magnitude of the building, a town was constructed nearby for the workers and their families. Me beside the Great Pyramid. The pyramids may look like they’re right out in the desert, but they’re also right on the edge of Cairo. Here you will find the step pyramid of Djoser. It was built during the 3rd dynasty (27th century BC). The step pyramid is the predecessor to the later pyramid style found at sites like Giza. The step pyramid complex would have been the size of a small village at the time it was built and even contains underground tunnels, galleries and chambers that extend nearly 6 km. Dashur is around 40 km south of Cairo and it the location of the Red Pyramid and the Bent Pyramid. The Bent Pyramid was one of the earliest attempts at making a pyramid with smooth sides, but it didn’t work out due to structural issues. Can you imagine being the poor person who had to tell the pharaoh his pyramid was bent? The Red Pyramid was the next attempt, which did work out. Both of these pyramids were constructed for the pharaoh Sneferu, who was the father of Khufu (builder of the Great Pyramid at Giza). Luxor Temple sits right in the centre of the city of Luxor, which was once the ancient Egyptian city of Thebes. The temple of Luxor was mainly built by two different pharaohs – Amenhotep III and Ramesses II (my other favourite historical figure). The inner rear chapels were built by Amenhotep III, whereas Ramesses II mainly constructed the outer parts. At the entrance, there were once six statues of Ramesses II and two obelisks. The slightly odd angle you can see looking in is due to an addition by Ramesses II. Here you can see the long causeway leading up to Luxor Temple that is flanked on both sides by rows of sphinxes. At the site of Deir el-Bahri is the temple of Queen Hatshepsut. This is one of the extremely popular tourist destinations in Egypt, as the temple has been reconstructed using parts of the original building and three levels are available to view. The ruins of an earlier temple to a lesser known pharaoh Mentuhotep II sit just to the left side of Hatshepsut’s temple. As Hatshepsut’s temple is west-oriented, the remains of Mentuhotep’s temple sit to the north. While it doesn’t look like much from the entrance, the Valley of the Kings is an amazing place to visit when you realise how big it is and just how many royal tombs lie within. A ticket grants you entrance to three different tombs, but if you want to see inside Tutankhamun’s tomb, you do have to pay extra. Honestly, it’s not really worth the extra money – inside is small, you can only move into one tiny room where you have about 30 seconds to look at everything before you’re told to hurry up and get out. There are photos of every part of the inside in books and online, and many of the treasures are in various museums, including the Cairo museum. Getting to see the inside of other tombs is really interesting and absolutely worth it. Seeing beautifully painted murals that have lasted for thousands of years is just spectacular. If you love Ramesses II like I do, then you should definitely visit the Ramesseum. The building is a large memorial to the pharaoh and took nearly twenty years to complete. The site for the Ramesseum was selected as it was close to the Valley of the Kings. The temple complex covers an area of 6 hectares because Ramesses liked to build the biggest and best temples to himself. I couldn’t imagine what a pyramid to Ramesses would look like! Elephantine is an island in the Nile near the city of Aswan. The site at Elephantine was excavated in the early 20th century by German archaeologists after papyri were found by farmers on the island. The island was once called ‘Abu’ meaning ivory or elephant. The island was inhabited by people from early Neolithic times up until the early Islamic period. A step pyramid has been found amongst the ruins, which would have been used by the governing force of the area. Abu Simbel is located to the far south in Egypt, right near the border to the Sudan. The complex contains two large temples, one for Ramesses II and one for his wife Nefertari. Both temples had to be moved in the 1960s, as the creation of Lake Nasser, which formed after Aswan Dam was built, would have submerged both temples in water. The temples had been forgotten with time and buried under sand until the top of one was discovered in the early 1800s by Jean-Louis Burckhardt. Abu Simbel is worth the trip – around 300 km by road from Aswan. The temples are beautiful and the scale of the statues is just incredible.